New for Fall 2011 : Oh, this one is gonna be tough... must resist urge to make juvenile jokes over and over again... like pretty much every other website.... Hey, speaking of that, how come all those high profile websites got free ice cream and t-shirts while I had to travel to -8- grocery stores to finally track down a pint of this stuff? In fact, I almost missed it. My pint was all by itself, all the way at the back of the freezer, spun around so that all I could see was the S in Schweddy. one that actually has pictures of the ice cream! 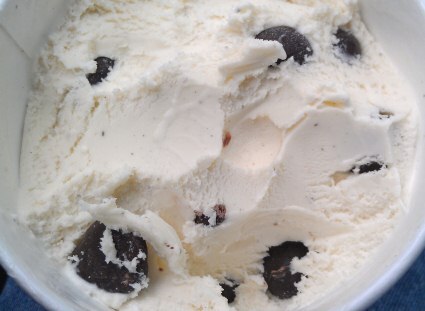 Ok, I think everyone has seen this view by now, but just incase you haven't, here's the description: Vanilla Ice Cream with a Hint of Rum & Loaded with Fudge Covered Rum & Malt Balls. When alcohol is mentioned, I worry that we could have another bonaroo buzz on our hands, but let's hope for the best! Well, it's definitely a slow starter visually, but is this picture really a good indicator? 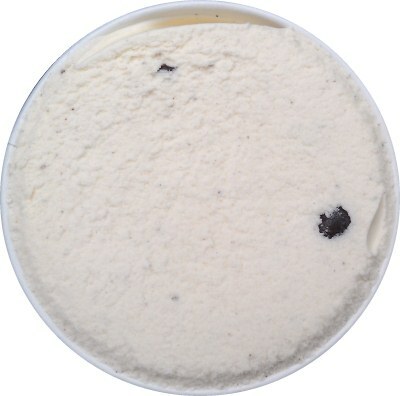 If you look closely at the two pictures above, you will notice vanilla bean flecks in the ice cream. You might also notice that the color is just slighty off by being a smidge more brown than B&J's typical vanilla offering. Now a lot of people have been complaining about the "hint of rum", and in their defense, "hint" might be too strong of a word. The base ice cream is typical excellent B&J's vanilla though basically you can tell that it's not straight vanilla. So it's not that you can taste the rum, it's that it doesn't taste 100% like normal vanilla. "Subtle hint" probably would have been a better way to word it to help keep people's expectations low. 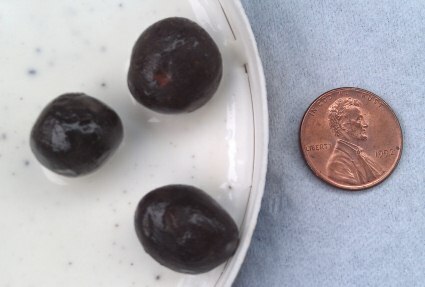 All three of these are rum balls, and as you can see, they do vary in size a bit. In my pint, the rum balls seemed to outnumber malt balls by at least 3 to 1. There's no way I could easily cut a malt ball with my spoon, but I think this shot of the rum ball says alot. We've got a super thick fudge coating around a soft, rum flavored center. Please note that it's not a robust rum flavor either. You could easily tell me that these were something else and I wouldn't have known the difference. Also, they aren't crunchy and they aren't textured weird, I find that they are actually quite pleasant actually. I like the fact that they are soft but don't stick to your teeth or feel chewy. I am tempted to describe them as being like a somewhat dry brownie (as opposed to an ooey gooey brownie). Part of me wants to say that they could have forgotten the malt balls all together, but I do like that occasional crunch that keeps you off guard. I did find that the malt texture did tend to linger a bit unlike the other components of this treat, but this is ok because you don't hit them too often. Sometimes I complain that a flavor isn't consistant, but in this case it's a good thing. It goes from a few pleasant bites, to crunchy for a moment, to a little malty, back to pleasant again. It makes this flavor more unique. Now granted I hadn't eaten lunch, but I easily plowed through half this pint in no time. It's a surprisingly mild flavor that goes down very easy. I could have easily polished off this entire pint as I sat in the grocery store parking lot. Thankfully, reminding myself that the whole container would be 200% of my saturated fat for the day was enough to get me to stop... 'til late afternoon when I polished off another serving. So, taken all that I've said into account, rather than a bunch of repetitive (albeit sometimes amusing) jokes, I think you can see this one is different and worth a try. The secret is setting your rum-fueld expectations low so that you won't be disappointed like so many other reviewers. This isn't Captain Morgan's Schweddy Balls, it's Ben & Jerry's ice cream, and you're probably going to like it, just be warned you might want to devour the whole pint in one sitting. I couldn't accept the blasphemous hate shown towards a new Ben & Jerry's flavor. So, I tried some too. I guess that it can be enjoyable if you ignore the expectation of rum. 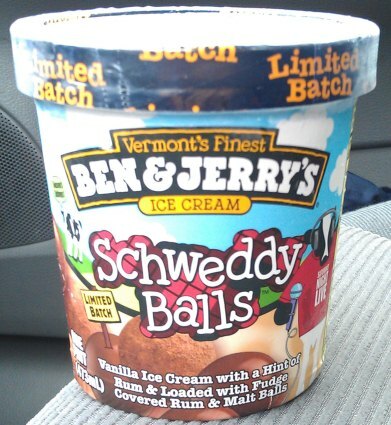 This looks a pretty good ice cream to be honest, love the look of the actual balls, they look good! @Dubba and Julien: What stores did you guys find it in? @LoC: the cross section shot is pretty cool, isn't it? @Danielle: I have been to Shaws, Price Chopper, Market Basket, Target, Walmart, Stop & Shop, Roche Bros and then finally found it a small chain called Donelan's. @Danielle: Well, I actually found it at the Ralph's near my house, which occasionally gets new stuff early, but is usually a little late. You could always call up your local Ben and Jerry's scoop shop and see if they have it in scoops or pints. Danielle: Walmart had it here in the Seattle area. I liked it quite a bit, but probably wouldn't buy it again. It tasted a lot like Vanilla Heath Bar Crunch, but with a nice undercurrent of rum. VHBC is one of my favourites, though - I love the texture of Heath Bars w/ice cream, and would rather have the flavour w/the Heath texture than with the ball textures. If they added a rum ribbon to Vanilla Heath bar Crunch, it would be heaven. Gotta say, I gave it a try and didn't really like it. My opinions were the exact opposite of yours too. My favorite part of the ice cream was the malt balls and the least favorites were the actual rum balls and the ice cream itself because of the rum flavoring. I HATE rum though, so I guess that could be expected. I did a review of it at CrazyFoodDude.com if you or anyone else are interested. I finally located and had this ice cream and lemme say I was super happy with it! I could taste the rum in the vanilla base which was just enough b/c I'm not a huge alcohol drinker even in my mixed drinks. I also enjoyed the mix of hard with the malt and soft with the rum balls and like you Dubba I ate the whole pint in one sitting which is always a good sign!